Most Twitter hackers go after heads of states or companies to stir up some humiliation. But today's target is Burger King, which has been transformed into a combination of McDonald's and amphetamine addict. Enjoy it while it lasts. It's not Anonymous, it's not UGNazi, it's... I have no idea who it is. He seems to like Chief Keef, so that's cool. But the Fish McBites background is a lovely touch. Update: Alright, this got a little weirder. The New Yorker's Caitlin Kelly points out a reference to the Defonic Team Screen Name Club, a hacker cadre that infiltrated Paris Hilton almost a year ago. 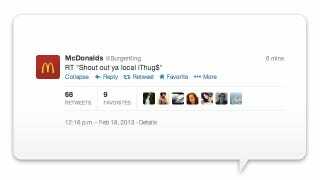 Update 2: The Burger King President's Day Hack Squad has some admirers over at Anonymous! Update 3: The Burger King account has gained over 20,000 30,000 followers since it was compromised. Someone at BK corporate owes these hackers a meat gift basket. Update 4: After well over an our, @BurgerKing is suspended, and a grieving nation can enjoy its lunchtime in relative peace while the BK social media team screams at one another and cleans things up.